I decided to write to our minister for health regarding the scary prospect of the end of independent midwifery. Please have a read of what I wrote, and be moved to write your own letter - soon! 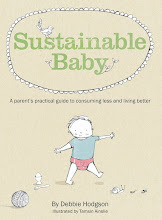 I am a former current affairs journalist, now a book author (Sustainable Baby, to be published mid-2009). I am a mother of one, and planning to have my second child at the end of September, delivered at home by an independent midwife. I’d like to add my voice to the many others to plead with you to do something about saving homebirth midwifery. The report of the last Maternity Services Review states that the Government will not support the costs of private homebirth services under the Medicare Benefits Schedule, nor will they help to provide indemnity insurance assistance to midwives working in private practice. If plans go ahead to establish a national registration body for health professionals, for which professional indemnity insurance will be mandatory, I fear that subsequent children of mine and those of my Australian sisters everywhere, will be denied the birth experience (homebirth) which is actually the gold standard of maternity (and therefore baby) care, according to the World Health Organisation. Birthing at home can be a more sustainable choice, both financially for the entire health system, and in terms of consumption of medical equipment and the myriad of throwaway items found in hospitals. With proper midwife care, it can also be the best possible start for a new human being. My great-great grandmother was jailed in South Africa for helping impoverished women abort unwanted foetuses. I think the prospect of making it illegal for women to help other women give birth as they choose, in this day and age, and in this country, is absolutely untenable if we consider women to have gained more liberties since then. I ask that you support a woman's right to choose where and with whom she gives birth, in 2010 and beyond.